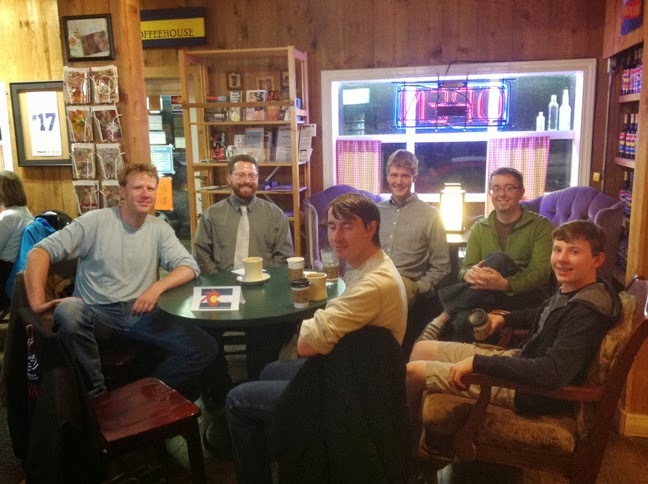 Seven Blenderheads braved some cold, wet Colorado weather to come out for some hot coffee at the CBUG meeting at the Fika Coffeehouse. Clockwise from the left: Ryan, Ben, Ben, Chris, Richard, and Harrison (with me behind the camera), thanks guys for coming out! Two weeks ago I attended Adobe's Create Now Tour event (use this if you're on a mobile device). I took notes and thought I'd share some of the things that caught my interest. Behance/Prosite looked like it might be a decent option for a portfolio site. I've been ignoring it for some time, partly because the name "Behance" kinda bugged me. The Image Size command has been updated. It does an amazing job of upsampling. The new algorithm is called Preserve Details. The default is Automatic, but who knows what that means? The Patch tool was another that struck me as immediately very useful. Worth checking out. Vector shapes can now have changes made to them (like rounding corners) live. Camera Raw is now a plug-in. The should increase its usage, I imagine. You can have multiple radial filters, non-destructive healing, and lens correction. You can copy the CSS from a type layer or folder. You can also generate Edge Reflow projects. And I almost (did) forgot the Generator plugin. I used it later the same day after hearing about it. Perfect for generating images of multiple sizes (like when you're doing iOS icon work). You can now paint with raster images. The guys on stage were pretty excited about this, but it seemed more like a feature for demoing. Reminded me of Painter's "image hose". The most exciting enhancement was the Touch Type tool. You can alter individual letters without breaking the text apart. Rotate, scale, etc. How many decades have I waited for that? (I started with Illustrator 1 in 1987). The guys said something interesting about the dark interfaces with the Adobe apps, that dark means the app has been completely re-written. InDesign now has a dark UI. It is 64-bit, does background processing. I liked the new smarter search for fonts and the ability to favorite fonts. There is a feature for generating QR codes. You can also output as an app for iPad. That looked interesting in the demo, but I wonder what the real world experience is. App development is not trivial and performance is key. This is a tool for creating CSS. They showed creating a page from an open PSD. It also support CSS regions. An interesting menu was for "shiney" new features to use that are on the bleeding edge. Muse is for creating small HTML sites without coding. It looked pretty decent. They played up the similarities to InDesign. TypeKit is built-in with access to 400+ fonts. It does not support responsive design, but it does make it easy to create different sized versions of a site. This tool has been percolating for a couple years now. It becomes more Flash-like all the time. Now it has symbols. You can bring the .OAM package into InDesign. They have a Kuler iPhone app, which reminds me I should download it. It was very cool (no pun intended) when they took a picture and got a color set from it. It also has Idea integration (Idea is a very nice vector iPad drawing app). All done in the form of a project. 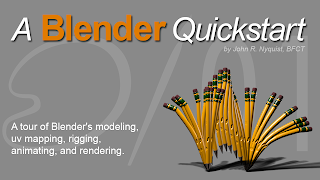 From scratch you'll build and animate a pencil. I hope you enjoy it. Colorado Blender User Group meetup.